The Standard Vita Report produces vitas for selected faculty members. A single Vita, as well as vitas for multiple faculty members, can be exported to the printer, Microsoft Word, or PDF. To access the report, click the Navigation menu, in the Admin section, then click Reports. The Reports screen displays. 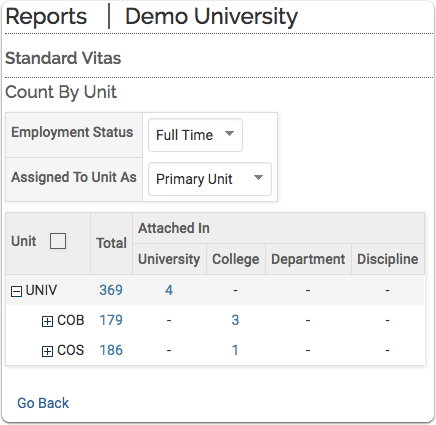 Select Standard Vitas (under Administrative Reports). The Standard Vitas - Count by Unit page displays. If necessary, change the Employment Status by selecting the appropriate employment status from the drop-down. Assigned to Unit As defaults to Primary Unit. The available options for Assigned to Unit As are primary, secondary, or both. Click the hyperlink number for the unit corresponding to the faculty member. If necessary, click the plus sign to expand a unit. Template: Select the vita drop-down to be used. Begin and End Semester: Select the academic terms for the vita you wish to view. Employment Status: Select the appropriate employment status from the list. Assigned to Unit as: Select either Primary Unit, Secondary Unit, or Both. 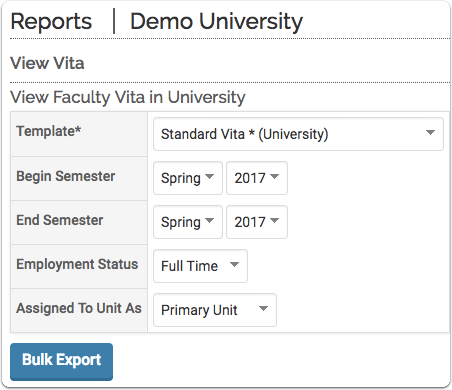 To export vitas for multiple faculty members, click the Bulk Export button. A dialog box appears. Click the Select Faculty button. Use the faculty selection tool to specify the faculty for whome a vita should be exported. Document Type: Available options are print, Microsoft Word, and PDF. Note: Selecting Microsoft Word or PDF format will create a .zip file of all the vitas. To export a vita one faculty member at a time, click the export icon for each faculty member. 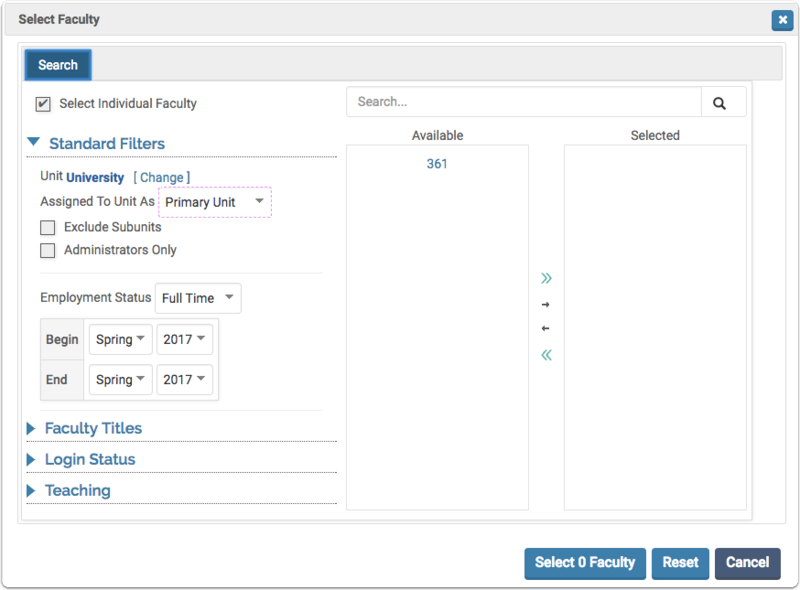 To search for a particular faculty member, enter the name in the Search box.